First, some literary and historical considerations. Kitchen points out, as have many others, the loose but clear literary links between the text of Genesis from ch1 through to the end of the Flood story, and the ancient Mesopotamian equivalents in the Sumerian king lists, The Eridu Genesis and Atrahasis, as well as (possibly) the Adapa myth and the famous Epic of Gilgamesh, which undoubtedly used a source like Atrahasis as source for the relevant Flood episode, in what is a composite epic poem about the ante-diluvian king Gilgamesh. We can add, to that, Irving Finkel’s recently-published tablet with yet another variant of the Atrahasis story, this time with a circular “ark”. Now, Kitchen’s point on this is that all these varied but parallel sources, in their present form, date to around the early 2nd millennium BC, which would also be more or less contemporaneous, on various evidential grounds, with the patriarch Abraham. He suggests, very plausibly, that only at this early period would the first chapters of Genesis take the overall shape they have, rather than how they would look in the much altered literary conditions of, say, the Babylonian exile in the 6th century. 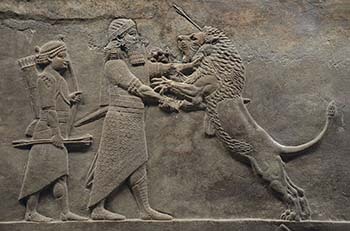 If so, we must conclude that Genesis is of equal weight in seeking to discover the original basis of the narratives as the cuneiform texts, being of the same antiquity and geographical provenance. However, the varied character of all these sources (as well as their memory of an epochal Flood long before) suggests that they have their roots in divergent earlier traditions, written or oral, of the third millennium – raising the possibility that Abraham’s family preserved an otherwise lost variant (without our making any faith-based judgement here on its relative historical value). Moving on, there seems little reason to doubt nowadays that lower Mesopotamia, at least, always prone to periodic river floods, once suffered something far beyond the usual, which seems to have marked (archaeologically) a transition between the “Uruk” period and the next phase of civilization, and which is routinely regarded in the Mesopotamian tablets as the dividing point of their history. The seventh century Assyrian king, the scholarly Asshurbanipal, wrote that he studied pre-flood documents in his extensive library. Various hints in the documents and scattered evidences from archaeology place this flood around 3,000BC, though conclusive evidence for its exact date and extent is ambiguous and scattered. I’ll return to some new evidence in a bit, but first let’s consider Eden. The genre of Genesis 2-3 has always been open to all kinds of speculation, but the Mesopotamian literature helps narrow things, both in showing the general literary conventions in use at the time, and in suggesting, as above, that Gen 1-11 follows the Atrahasis pattern of “proto-history with divine elements”. So the Flood narratives, overall, employ various symbolic elements, different theological points and varied details about who and what was rescued, but can at least be referred to a significant historical event. Genesis 2-3 also contain unusual supernatural features (talking snakes, trees of life and so on are in a different league to attributing a massive flood to divine judgement and deliverance from it to divine revelation and providence). But the garden itself is introduced in a stubbornly realistic and detailed geographical setting, which is simply absent from truly mythical ANE texts and Israelite poetic literature both. For instance, ideas that the Gihon river is symbolic of the spring supplying Jerusalem, or that the reference to its flowing through “Cush” makes it either a symbol of the Nile, or an indicator of a global flood shuffling countries about, are alien to anything in the ANE sources. There geographical settings are always used for real events, however theologically or symbolically those events might be treated, and in Genesis the geographical setting is described to help his readers find it on their “map” (though the passage of time makes it easy for us to lose it from ours). Furthermore, the geographical setting can be given broad sense from archaeology, as Kitchen points out regarding the recent discovery of likely candidates for all the rivers mentioned in the vicinity of the garden. Assuming it to be a true geographical description, it was never plausible to interpret Genesis as meaning that Eden’s river split into four downstream of it: rivers just don’t break into major distributaries serving different lands. But upstream tributaries do combine to make single rivers, as the Tigris and Euphrates do now. 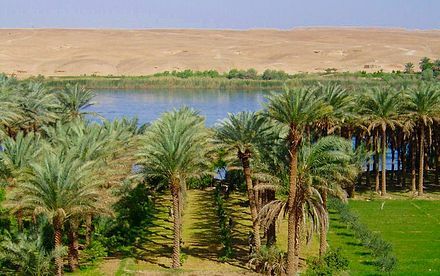 It was long suspected that the second-mentioned river, the Gihon, represents the present Karun river, flowing from the north into the combined Tigris-Euphrates. 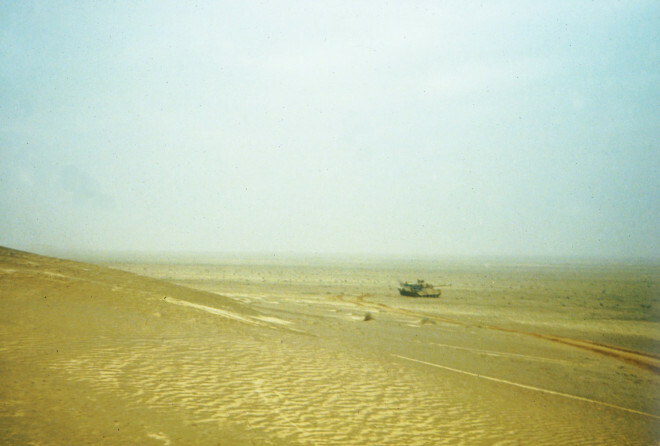 But only relatively recently was it shown that, to the southwest, an ancient river system once flowed to the head of the Gulf, across what is now Kuwait, from the hinterland of Northern Arabia, the biblical Havilah. So it is a perfect candidate for the River Pishon. The bad news, however, is that the evidence suggests that, owing to a drying climate, the Pishon stopped flowing c.2,500 BC, half a millennium before our earliest cuneiform Genesis parallels. 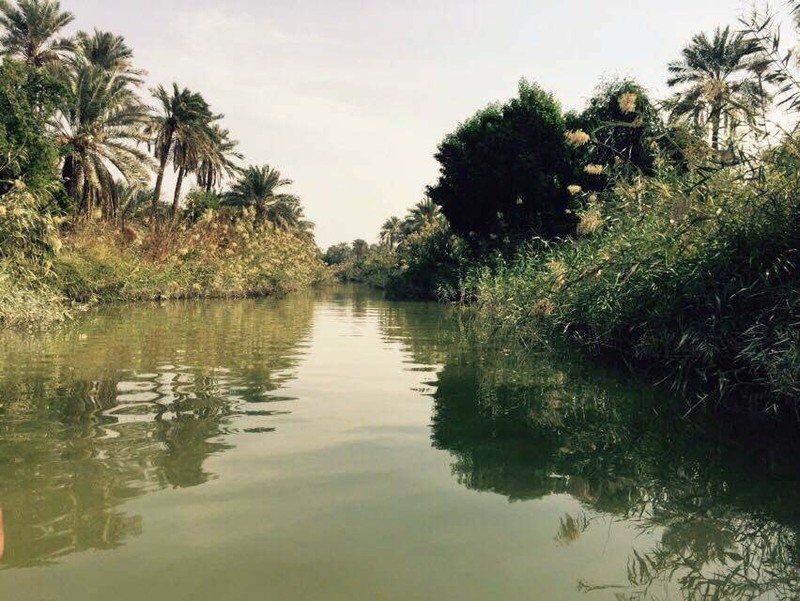 All that is left in Iraq is the Wadi al-Batin, which only flows occasionally. If Genesis contains reliable tradition, it would have to have arisen before 2,500BC and been passed down to Abraham and the final Genesis writer either orally or in writing for 700 years and more. But there’s worse. In the early second millennium, and for over a thousand years before that, the shoreline of the Persian gulf was far inland from its present position – see on the map how the earliest cities like Ur hug the ancient shoreline. The Pishon and Gihon would then have opened into the Persian Gulf, not the river, as they do now, and in fact even the Tigris and Euphrates apparently had separate mouths then. Only much later did alluvial deposits push the shoreline back far enough to conceive of all four rivers converging in a land of Eden, and by then all memory of the Pishon as a true river must have long faded. The history of the Gulf shoreline is difficult to determine exactly because of a complex interplay between rising sea levels after the ice age (all agree the whole Gulf was dry, if swampy, in 17,000BC), climatic change (the late prehistoric period was wet, becoming dryer as southern Mesopotamia was settled) and alluvial deposition. It seems generally agreed that the highest shoreline existed around 5K years ago – the approximate time of the epochal Flood. A 2015 article, though, provides some interesting detail relevant to my purpose here. By studying the “fossilized” shorelines of the Gulf, the researcher found that levels changed through intermittent relatively rapid incursions and retreats, rather than gradually. He found, as well as the present shore, two (and only two) more old shores. The earliest was at approximately the same level as the present one. The second marked the highest extent of the sea-level rise, carbon dated from deposits to around 3,000BC. The author’s historical interest is the archaeologically confirmed flooding of Ur, rather than the biblical account, and he considers that such a rise of sea level would have had significant hydrological effects very far upstream which, with unknown contributions from heavy rainful, would have been sufficient to account for a cataclysmic flood of the land (remember that “the earth” was the term the ancient Mesopotamians used for their land. There was no term for the whole world). The sea appears, from archaeological remains, to have returned to more or less its present level by about 2000-1500BC. At present I don’t think there is information to date the earliest shoreline mentioned in the study archaeologically, for ephemeral remains would have been first flooded by the sea’s rise, and then stranded (and buried under alluvium). But it would seem probably that the transition must have been relatively rapid and incremental, or other shorelines would have been preserved. So the sea was probably close to its current levels just a few centuries before the Flood. Here’s the bottom line. There was a time, according to the text, when the four rivers named in the Genesis account did, indeed, flow into one, watering a fertile alluvial plain between their junctions and the sea. The earliest time for this islimited both by human memory and the post-ice-age filling of the Gulf. But the very last time that it can have occurred would have been in the 4th millennium BC, and well before the Flood that is remembered in Babylonian history as well as Genesis, and whose deposits have been found in the ancient cities by at the assyriologists in their digs. 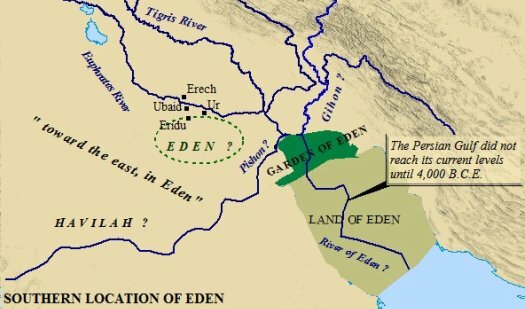 It was around 3,500BC that a formerly wet climate began to dry, leading to prolonged drought and little rainfall in the ANE – so at that time our Eden would have been watered primarily by annual river inundations, like the Nile (or like the Cities of the Jordan Plain in my recent post!). Gordon Wenham’s commentary suggest that the word ed often translated “mist” in Gen 2.6 is akin to Sumerian/Akkadian id, the freshwater cosmic river, and that the old translations translated it as “spring”. This, again, is a geographical prompt describing a land watered by inundation – though without crops until cultivated by man. How such an incredibly ancient tradition might have lasted through to the writing of Genesis is impossible to say. 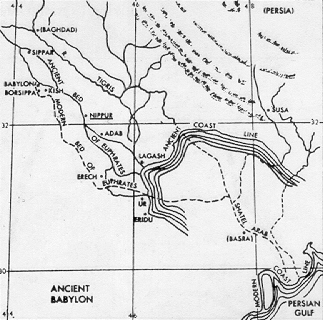 But nobody familiar with the geography of lower Babylon in historical times could possibly have thought of such an anachronistic narrative and written it down without being universally ridiculed – there was not even a written script in the 4th millennium with which to record the changing topology, even if there had been hydrologists around to do so. And nobody ignorant of the geography (such as some scribe in first millennium Israel) could have accidentally hit on a geographical description that so closely matches the long lost time and place it purports to describe. This entry was posted in Adam, Genealogical Adam, History, Science, Theology. Bookmark the permalink. Its always been said that it was pre flood. The flood changed everything and strange to think these are the same rivers. The first clue is however that the bible has the river come first and then turn into four heads. Why not? Its a different world then. In fact in a perfect world there would be no rivers/astreams as we now have them. All our rivers/streams are the result of errors in the landscape. They only exist because of holes in the ground that should not be there. The hole is unnatural. it fills with water and overflows and these bump into each other and you have a river soon. Even a mountain interferes with the rain and thus the only reason for water from there. In a pre flood world there would be no holes. Indeed possibly no rain. only a dew settled. So water would have to come from the underground to have a river. so likely/piossiblr edens river is meant to have come from there and then dissipated into four smaller ones. They are mentioned to direct the reader but it really to say its different now. the river around cush doesn’t work and nobody then would think so. EDen vanished completely because of the flood.The reader is meant to understand that. Its another reason to understand where. Its possible the river heads do mean small rivers ending up into the big one and just a way of talking. however the source of the water is a issue. its all clues the world was a paradise first and weird. Genesis was written from gods spirit moving someone ioncluding the first verse. No carrying books around by people is the origin for genesis.